The telltale signs of a cockroach infestation—egg cases, frass, odor and the presence of cockroaches themselves—are not always the only available signals. In certain situations, there might be other hints (many of which are subtle) to steer you in the right direction. If you know what you’re looking for, the presence of certain parasitoid wasps is a red flag. 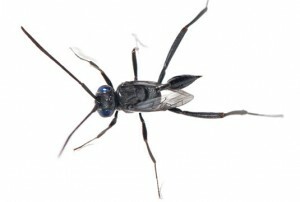 Some ensign, or hatchet wasps, which are in the family Evaniidae, can’t complete their life cycle without a population of cockroaches. If you come across one of these small (up to 1/4 in. long) and rather bizarre-looking wasps in a structure, you can bet that there’s a cockroach infestation in the immediate vicinity. Ensign wasps lay eggs in the oothecae of American, Australian, Florida woods, Oriental and other cockroach species in the family Blattelidae. A female ensign wasp locates the ootheca and lays a single egg inside. The developing wasp larva will eat all the cockroach eggs inside the egg case and prevent any cockroaches from emerging. If you familiarize yourself with the appearance and biology of ensign wasps, not only can you quickly identify a cockroach infestation on the spot without ever seeing a cockroach, but also save yourself the time and confusion of trying to identify the wasps themselves. If you do find ensign or any other parasitoid wasps, communicate to your customers about what their presence means — and reassure them that parasitoid wasps don’t sting people or pets. You can reach Dr. Bennett Jordan, entomologist and staff scientist for the National Pest Management Association (NPMA), at bjordan@pestworld.org.